"5 or so wrecks in a small marine park. 30 - 54 feet in depth, visibility fantastic. Turtles, Rays and numerous fish can be seen here." "Relaxing, sea horse, frog fish, 6 ship wrecks"
"Drift dive over the reef. Visibility again great (Feb) and similar aquatic life to Carlisle Bay but with more chances to see Rays.."
"Sting ray, Eagle ray, Lots of Turtles"
"Combination Reef and Wreck together." Family owned PADI centre established in 1994. $60 for 1 dive with kit (2007).
" My wife and I are middle aged and have just concluded our PADI Open Water Scuba diving course - Our Dive Master 'Michael' was excellent and we felt totally confident with him. he has a wicked sense of humour but at no time left us feeling unsafe in any way." " I would definitely not recommend Reefers and Wreckers dive shop. They are careless, dangerous, slapdash and ignore safety. They are particularly dangerous with children. DONT GO THERE!" " I found no problems with the professional attitude of the dive masters. I had a safe and pleasurable week with good diving!" PADI centre established 1993. $52 for 1 dive with kit (2007).
" We arrived 10 minutes before agreed time, but the boat had left already! Don't touch them! " " Fantastic dive operator - been diving with them for over a decade now. Would recommend them to anyone." PADI resort: 1 dive costs US$50 or BDS$100 (2007).
" I highly recommend diving with Andre, Roger or Christie at "Barbados Blue". Experienced divers, very knowledgeable about the ecological aspects of the reefs and wildlife, great people to dive with. " " I'd definitely dive with anybody from Barbados Blue again. All instructors very friendly and knowledgable. With 2 or 3 dives each day there will always be something that suits. " Specialise in semi-private and small group dives. US$65 for one dive. PADI and BSAC resort centre. "Fatema and her crew were excellent, professional and patient, they went all out to please, no rush, knowledgable about dive sites"
Shutters is a 4-bedroom house, sleeping 8 and offering comfortable rental accommodation on the west coast of Barbados. It is situated in Lower Carlton, in the parish of St James, just off the coast road between Holetown and Speightstown, five minutes walk from the beach. SCUBA diving is available within a 10 minute drive. Two companies, Reefers and Wreckers in Speightstown and West Side Scuba in Holetown, will pick you up from the house. 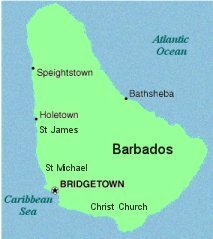 Please send us your comments on Barbados. Do you want to recommend a diving centre or dive site? Let us know. Have a question - we're waiting to hear from you.